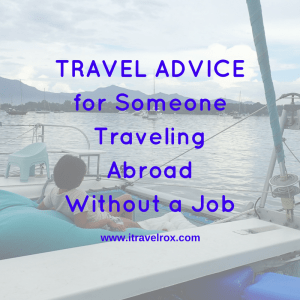 Any travel advice for someone traveling abroad without job but has a means to do so? As a Filipino traveler with a Philippine passport, sometimes it’s really difficult to travel in a different country. Sometimes, we think that traveling is for the rich or for someone who has a good paying job. How could you travel abroad without a job? Have you just resigned from your corporate job and you want to travel abroad? Are you a freelance online worker who loves to travel out of the country without income tax return? How to Prepare Yourself facing the Immigration Officer? Dress properly. Dress like you’re going on a business trip. Or go casual like wearing closed shoes or rubber shoes, jeans, a decent-looking t-shirt or a blouse. It’s cold inside the plane so bring a jacket. For an international trip, go to the airport as earlier as possible so that you’ll face the I/O in a relaxed manner. Be confident. Smile. Don’t act like a nervous freak. When the I/O asked you some questions, make it short but sweet. Don’t elaborate unless they asked you for further questions. Show documents only if they asked for it. Related Article: First Time Abroad: How I Almost Got Offloaded as a Freelancer? This is to show that you can really afford to travel out of the country even without a job because the I/O can see that you have the reasons to return to the country and not desperate to look for a job abroad. Related Article: How to Request Stock Certificate from COL Financial Philippines for Visa Application? When the I/O asks why you don’t have a job? Just be honest with your answer that you quit your job because you’re tired and you need a break from work. End the answer with a smile. We have the right to travel. Do you have any additional advice for our readers? Please comment below. This entry was posted in FACT Inspire, Money Matters, Tips, Travel and tagged travel advice, travel fund, traveling abroad with a job, traveling abroad without income tax return, traveling abroad without job, traveling abroad without work. Bookmark the permalink. Like me, I will be travelling abroad for the first time and before that I will be quitting from my work, I just hope that I wpn’t be offloaded. Any hints more than your post? This is comforting. I quit my job last year because I’m planning to go to law school this June. Going to Taipei this April with two friends (who are sisters and first time travelers; one is a master’s student and the other works for a big TV station in Manila so I don’t think they would have trouble with the immigration.) I’ve been to two different countries before (Singapore and Malaysia last year) but this is my first time dealing with an immigration officer without my family. I have three ATM cards (2 from same bank where my parents also work at) and two other VALID IDs aside from my passport. Do you think this would look good to the IOs in NAIA?